When I was quite young, my family had one of the first telephones in our negihtborhood. I remember well the polished oak case fastened to the wall on the lower stair landing. The shiny receiver hung on the side of the box. I even remember the number-105. 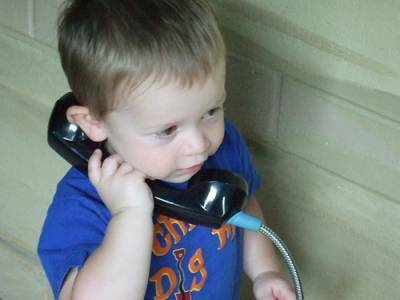 I was too little to reach the telephone, but my mother talked used to listen with fascination when my mother talked to it. Once she lifted me up to speak to my father, who ws away on business. Magic! Then I discovered that somewhere inside that wonderful device lived an amazing person-her name was "Information Please" and there was nothing she did not know. My mother could ask her for anybody's number; when our clock ran down, Information Please immediately supplied the correct time. My first personal experience with this genie-in-the-receiver came one day while my mother was visiting a neighbor. Amusing myself at the tool-bench in the basement, I whacked my finger with a hammer. The pain was terrible, but there didn't seem to be much use crying because there because there was no one home to offer sympathy. I walked around the house sucking my throbbing finger, finally arriving the stairway.The telephone! Quickly I ran for a footstool in the receiver and held it to my ear. "Information Please," I said into the mouthpiece just above my head. A click or two, and a small, clear voice spoke into my ear."Information." "I hurt my fingerrr—" I wailed into the phone. The tears came readily enough, now that I had an audience. "Isn't your mother home?" came the question. "Nobody's home but me," I blubbered. "Are you bleeding?" "No," I replied. "I hit it with the hammer and it hurts." "Can you open your icebox?" she asked. I said I could. "Then chip off a little piece of ice and hold it on your finger. That will stop the hurt. Be careful when you use the ice pick," she admonished. "And don't cry. You will be all right." After that, I called Information Please for everything. Iasked for the help with my geography and she told me where Philadelphia was, and the Orinoco—the romantic river I was going to explore when I grew up. She helped with my arithmetic, and she told me that a pet chipmunk—I had caught in the park just the day before—would eat fruit and nuts. And there was the time that Petey, our favorite canary, died. I called Information Please and told her the sad story. She listened, then said the usual things grown-ups say to soothe a child. But I was unconsoled: Why was it that birds should sing so beautifully and bring joy to the whole families, only to end as a heap of feathers feet up, on the bottom of the cage? She must have sensed my deep concern, for she said quietly, "Paul, always remember that there are other worlds to sing in." Somehow I felt better. Another day I was at the telephone. "Information," said the now familiar voice. "How do you spell fix?" I asked. "Fix something? F-I-X." A that instant, my sister who took unholy joy in scaring me, jumped off the stairs at me with a banshee shriek—"Yaaaaaaaaaa!" I fell off the stool, pulling the receiver out of the box by its roots. We were both terrified—Information Please was no longer there, and I was not at all sure that I hadn't hurt her when I pulled the receiver out. Minutes later there was a man on the porch. 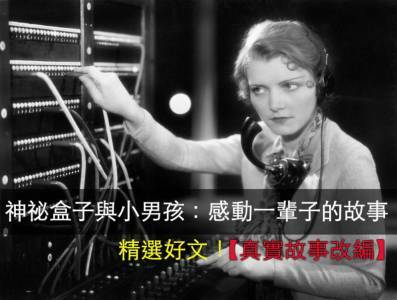 "I am a telephone repairman. I was working down the street and the operator said there might be some trouble at this number" He reached for the receiver in my hand. "What happened?" I told him. "Well, we can fix that in a minute or two." He opened the telephone box, exposing a maze of wires and coils, and fiddled for a while with the end of the receiver cord, tightening things with a small screwdriver. He jiggled the hook up and down a few times, then spoke into the phone. "Hi, this is Pete. Everything's under control at 105. The kid's sister scared him and pulled the cord out of the box." He hung up, smile, gave me a pat on the head and walked out the door. All this took place in a small town in the Pacific Northwest. Then, when I nine years old, we moved across the country to Boston—and I miss my mentor acutely. Information Please in that old wooden box back home, and I somehow never thought of trying the tall, skinny new phone that sat on a small table in the hall. Yet, as I grew into my teens, the memories of those childhood conversations never really left me; often in moments of doubt and perplexity, I would recall the sense of security I had when I knew that I could call Information Please and get the right answer. I appreciated now how very patient, understanding and kind she was to have wasted her time on a little boy. A few years later, on my way west to college, my plane stopped in Seattle. I had about half an hour between connections, and I spent 15 minutes or so on the phone with my sister who lived there now, happily mellowed by marriage and motherhood. Then, really without thinking what I was doing, I dialed my home operator and said, "Information Please." Miraculously, I heard again the small, clear voice I knew so well: "Information." I hadn't planed this, but I heard myself saying, "Could you tell me, please, how to spell the word 'fix'?" There was a long pause. Then came the softly spoken answer. "I guess," said Information Please, "that your finger must have healed by now." I laughed. "So it's really still you. I wonder if you have any idea how much you meant to me during all that time...." "I wonder," she replied, "if you know how much you meant to me? I never had any children, and I used to look for your calls. Silly, wasn't it?" It didn't seem silly, but I didn't say so. Instead I told her how often I thought of her over the years, and I asked if I could call her again when I came to visit my sister after the first semester was over. "Please do. Just ask for Sally." "Good-bye, Sally" It sound strange for Information Please to have a name. "If I run into any chipmunks, I'll tell them to eat fruit and nuts." "Do that, she said. "And I expect one of these days you'll be off for Orinoco. Well, good-bye." Just three months later I was back again at the Seattle airport. A different voice answer, "Information," and I asked for Sally. "Are you a friend?" "Yes," I said. "An old friend." "Then I'm sorry to have to tell you. Sally had only been working part-time in the last few years because she was ill. She died five weeks ago." But before I could hang up, she said, "Wait a minute. Did you say your name was Villiard?" "Yes." "Well, Sally left a messge for you. She wrote it down." "What was it?" I asked, almost knowing in advance what it would be. "Here it is, I'll read it—'Tell him I still say there are other worlds to sing in. He'll know what I mean.'" I thanked her and hung up. I did know what Sally meant.